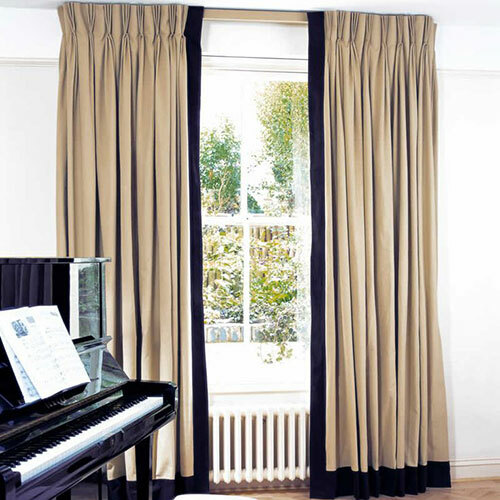 There are many different pleats and heading you can have on your drapes, each one creating a different look and style. 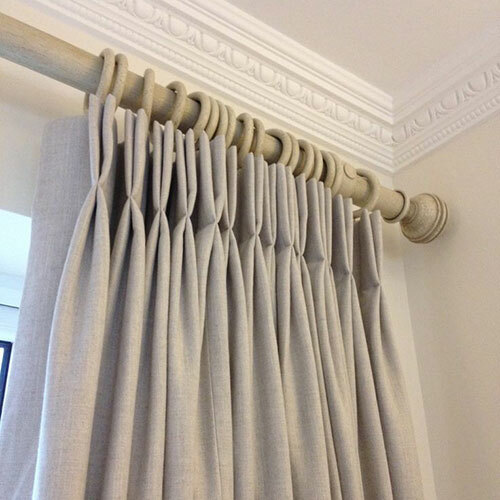 Each different pleat will not only change the appearance of your drapes but also the way they sit, stack, pull and the amount of fabric they will require. 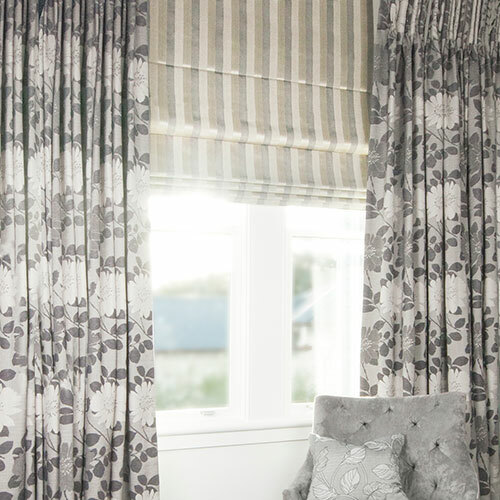 Have a look through the list below of our most popular headings and see what you think will suit your drapes the best. Click on each heading for more info. 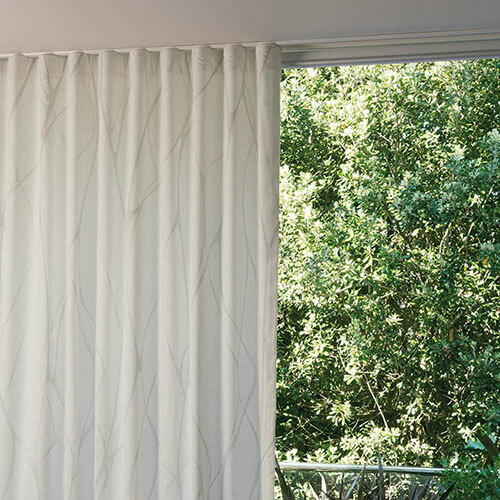 Or call us today for more info on how the different pleats work. Also known as Triple pleat; the French pleat is a very classical and formal look. As the name suggests it is made by taking 3 pleats together then leaving a small space before another 3 pleats are taken together. 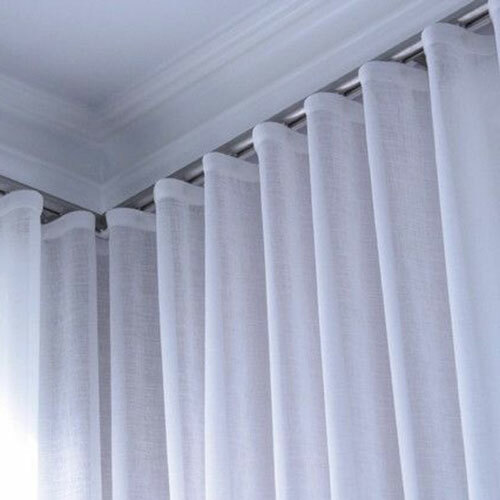 This pleat often uses the most fabric of all the pleats usually adding an extra drop per window however depending on the width of the window and the width of fabric you are using it may end up using the same amount as some other, ‘less full’ pleats. So it does pay to do your calculations. 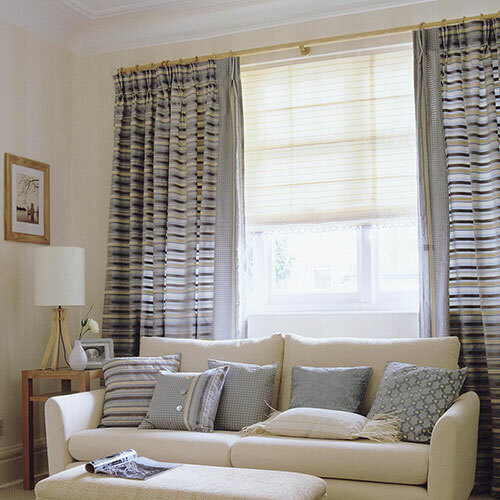 A very formal and elegant look, it looks great in more traditional style homes as well as looking just as great in some of todays modern homes. 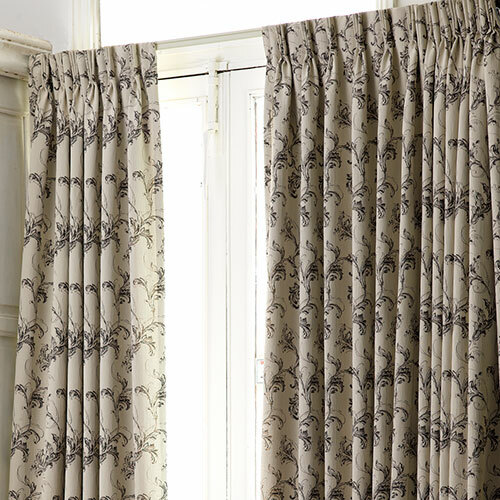 If you are using a particularly thick fabric we would recommend maybe a single or twin pleat instead. Stack back - The French pleat will need a bit more space on the edge of the window for stack back as there is more fabric. However it does stack back beautifully for the amount of fabric, stacking back much nicer than the Pencil Pleat. 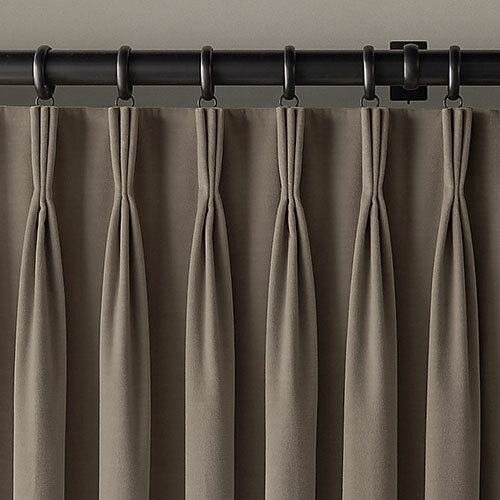 Also known as Dutch pleat; the Twin pleat is a more modern twist on the classic French pleat. 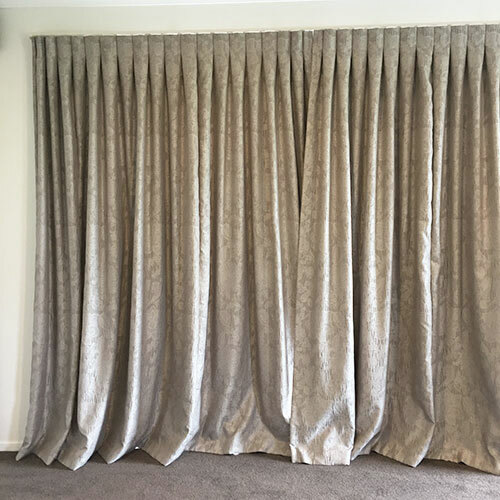 As the name suggests it is made by taking 2 pleats together then leaving a small space before another 2 pleats are taken together and so on for the width of the drape. This pleat has an average fabric usage, using approximately double the amount of fabric as track length. A formal yet modern twist on a classic it gives a simple and elegant look. Looking great in traditional homes as well as todays modern homes. If you are using a really thick fabric you may want to consider going down to a single pleat; it gives a similar style yet uses less fabric so you don't have so much bulk. However it is still possible to use a twin pleat with a thicker fabric. 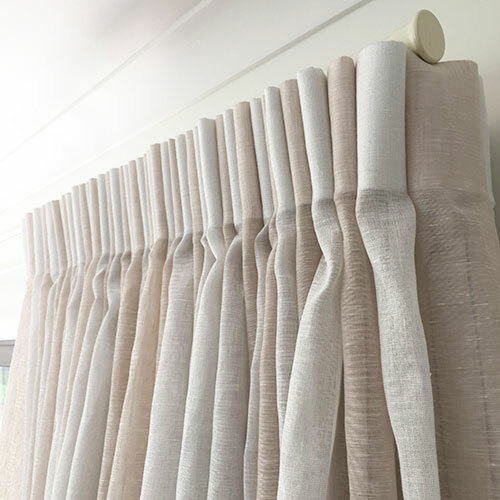 Stack back - The Twin pleat will need a bit of space on the edge of the window for stack back, not quite as much as the French Pleat. It will stack back really well into its pleats, better than the French or Pencil Pleat. Suitable for use with any tracking system. 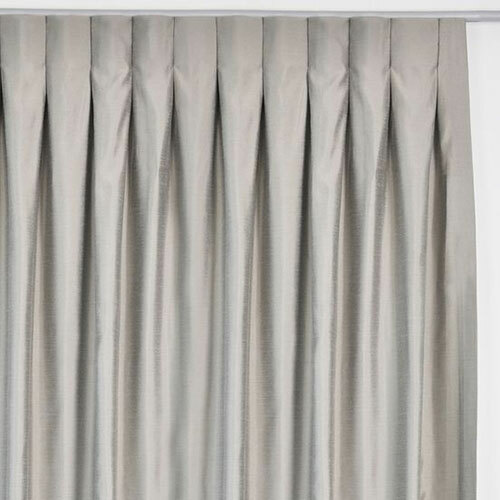 The Single pleat is a modern twist on the classic French pleat. 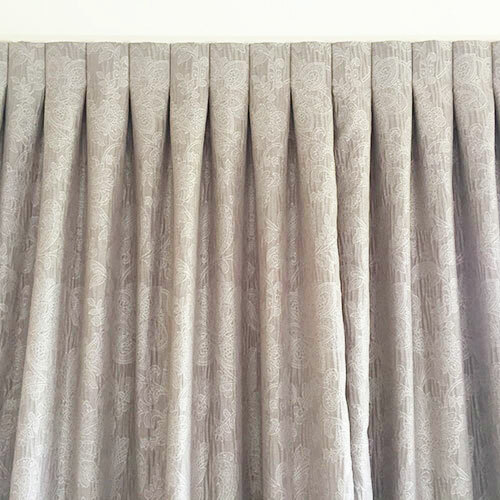 As the name suggests it is made by taking 1 pleat, leaving a small space before another pleat is taken and so on for the width of the drape. This pleat is at the lower end of the scale when it comes to fabric usage, using approximately 1.8x the length of track. 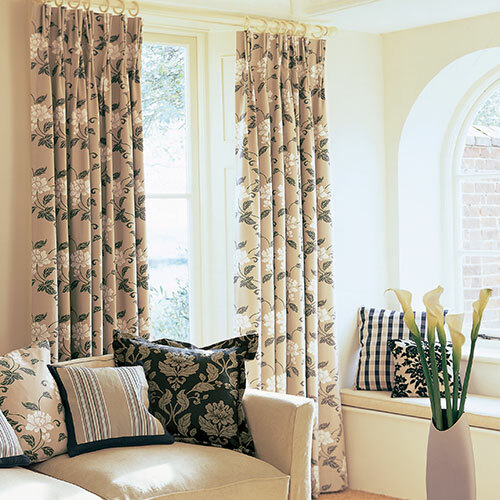 It gives a simple, yet elegant and formal look to a space. Looking great in todays home as well as in the more traditional homes;. 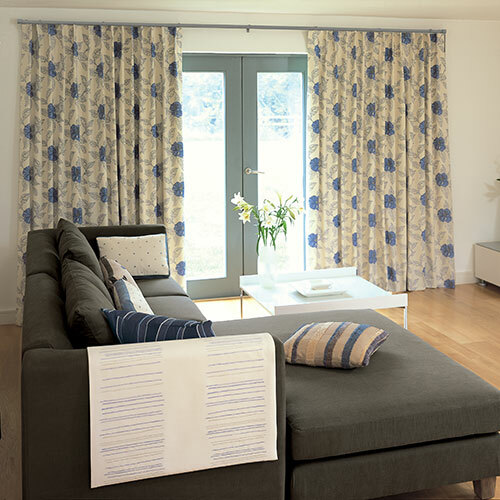 This style is great for the thicker fabrics as it users less fabric and so doesn't create as much bulk. 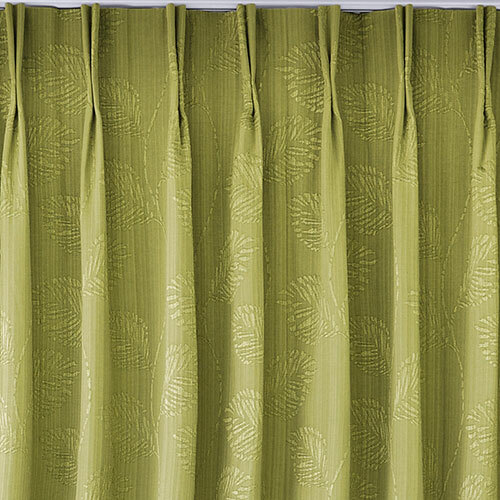 This pleat also works well when you would like the pattern or design on a fabric to show and be prominent. The single pleat allows you to see more of the fabric, when there is a lot of fullness the patterns can merge into the pleats a bit more. 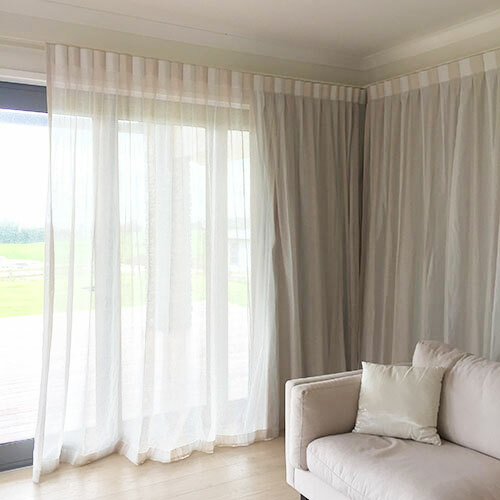 Stack back - The Single pleat is great for stacking back, it folds back beautifully into its pleats and with minimal fabric, leaves your window free to make the most of the views, or to allow the maximum amount of light into the room. Also known as an Inverted pleat or a New York Pleat. The Box Pleat gives a nice simple, modern appearance, pleated into flat segments at the top, similar to a box pleated skirt. 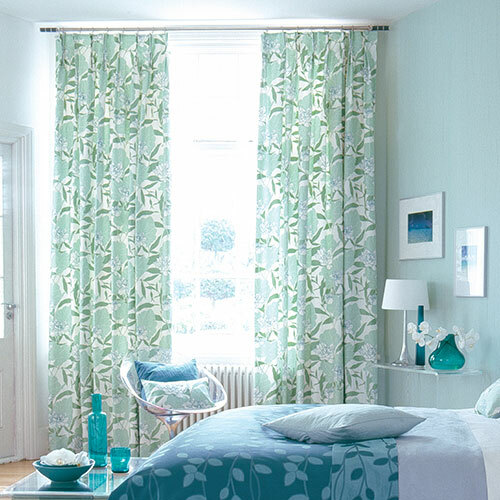 This works really well in modern contemporary homes and gives a simple, minimalist look. 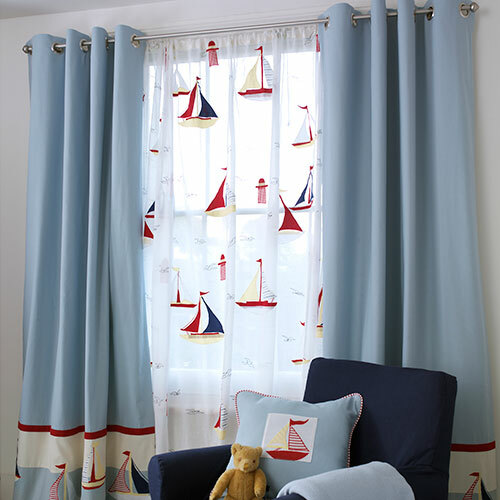 Can also work well in more traditional homes using a more traditional fabric. This Pleat can work really well with stripes and in some cases can be pleated on the stripes giving an even more accentuated stripe or pleat. 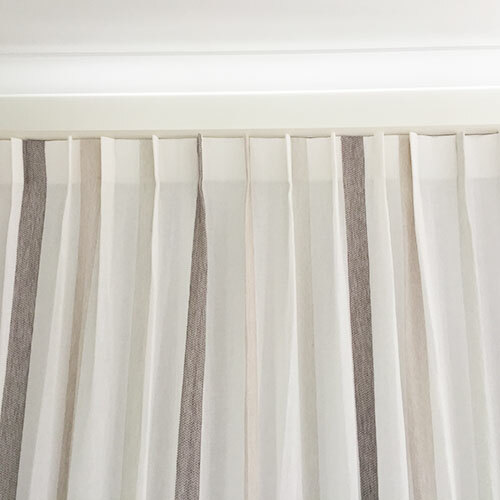 The Box pleat uses about 1.8x the track width however when it is named as the New York pleat, this often means there is not much fullness at all which can create a sparse look to your curtain. 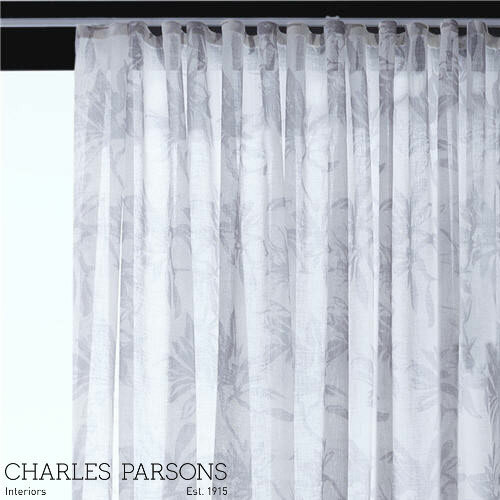 Similar to the single pleat this works great with patterns or stripes where you still want to be able to see a lot of the pattern as there is less fabric to gather. Stack back - The Box pleat stacks back quite well because of the fabric quantity however, because the pleats are at the back it doesn't stack back as well as the single pleat which has a similar fabric quantity. 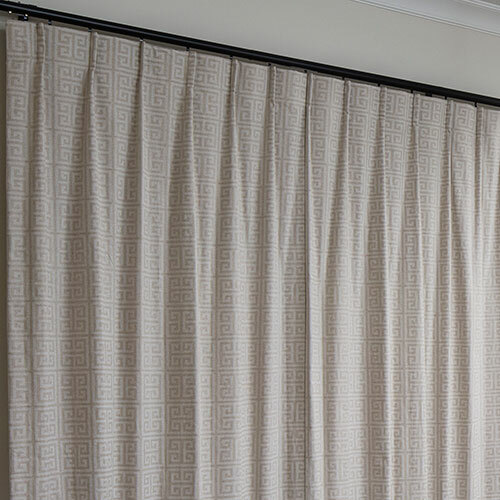 Suitable for use with any tracking system, however we prefer using a rod with the drapes hanging from underneath the rod. The Pencil Pleat is a nice simple, basic pleat. The traditional ‘gathered’ heading using what most people know as ‘rufflette’ tape which is pulled up by hand using the strings in the tape. This pleat is the cheapest to manufacture and uses approximately 2x the track width, however the beauty of Pencil pleat is that you can pull up to whatever width you prefer. 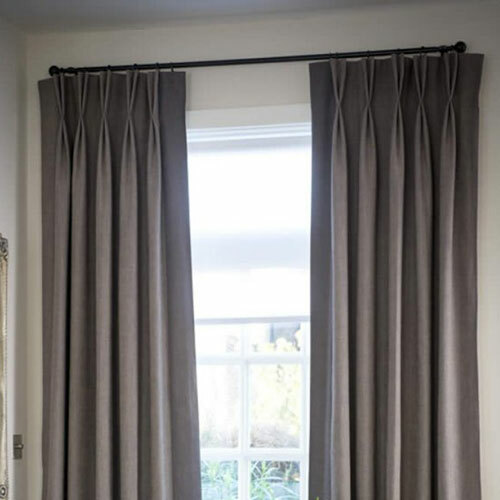 This gives you the flexibility to have a really full drape or a quite sparse drape so it is especially useful if you are unsure exactly of your width or if you are thinking of taking your drapes with you if you are moving or wanting to be able to use on different windows. 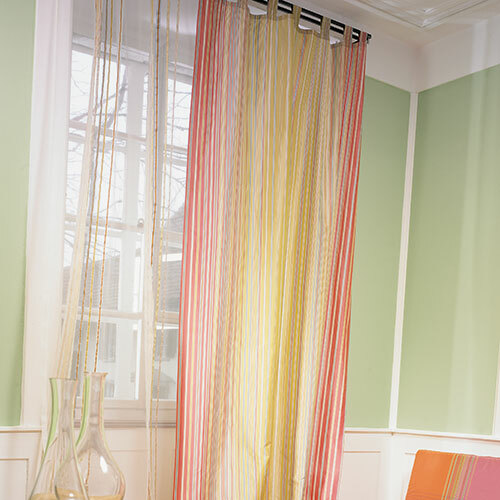 It gives a simple gathered look and will work with most fabrics. 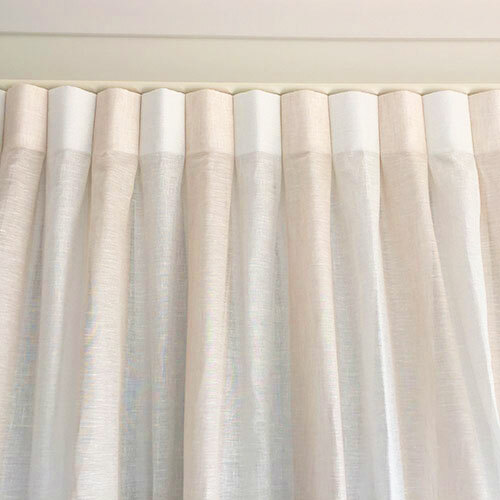 Stack back - The Pencil Pleat is probably the worst for stacking back, it doesn't pleat back as nice as the other more structured pleats so you will need to be aware of this when considering how far to take your drapes back on the side of the window. 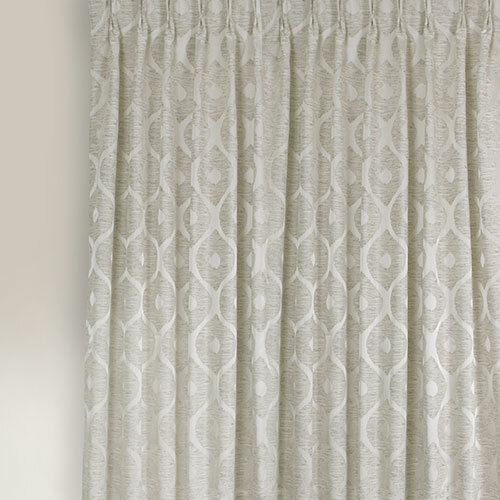 Eyelet drapes are a simple, modern style, heading giving a more contemporary look. 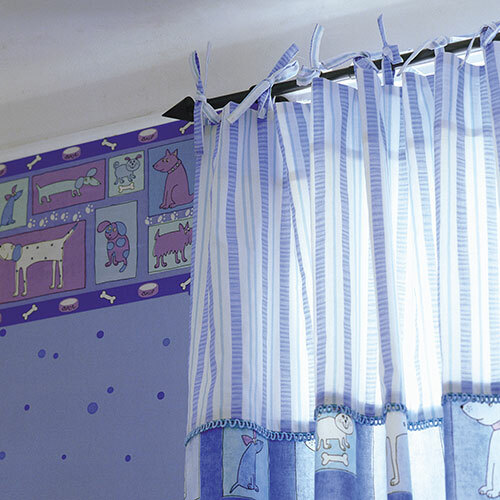 They are suspended from a rod through ‘eyelets’ that are punched into the top of your curtain. 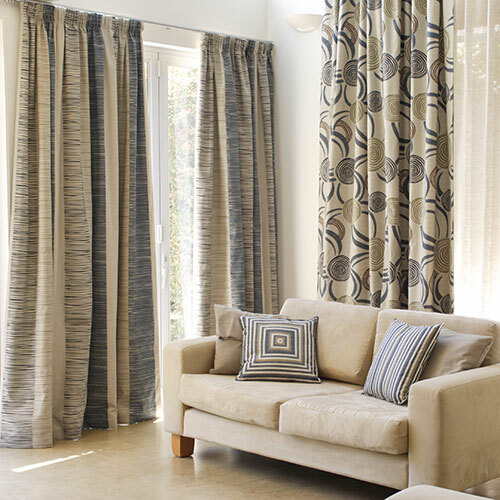 The simple and casual design works well in many different settings as well as being made with all different types and styles of fabric. They look best when just clearing the floor. 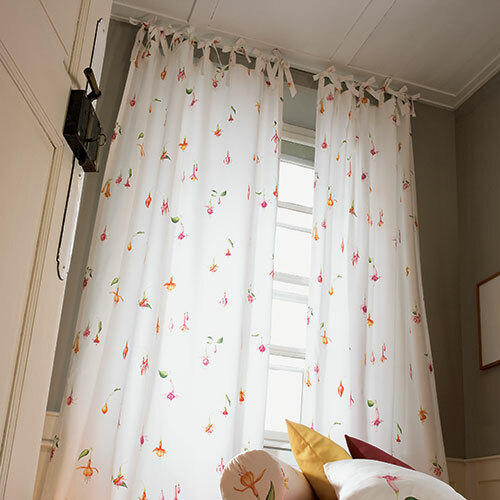 Eyelets aren't as easy to move along the rod as the standard ‘hooked’ headings and are not recommended to be used on wide windows. The eyelets themselves can not move past brackets so therefore there are less brackets on the rod to support it. The heavier the fabric the narrower the width that is recommended. Eyelets are one of the most expensive headings to manufacture but only use approx 1.7x the track width, however you can vary the fullness to suit your needs. 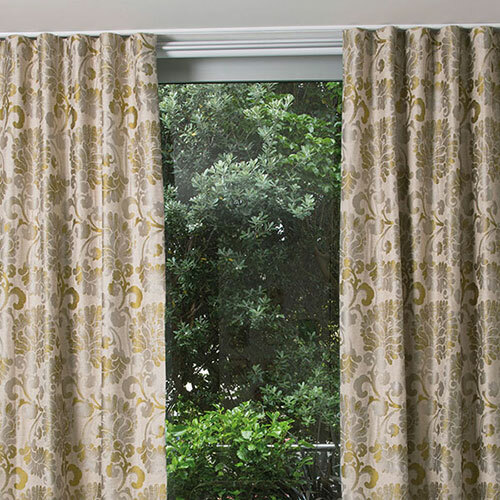 Similar to the single and box pleat, eyelets work great with patterns or stripes where you still want to be able to see a lot of the pattern as there is less fabric folded into the curtain. 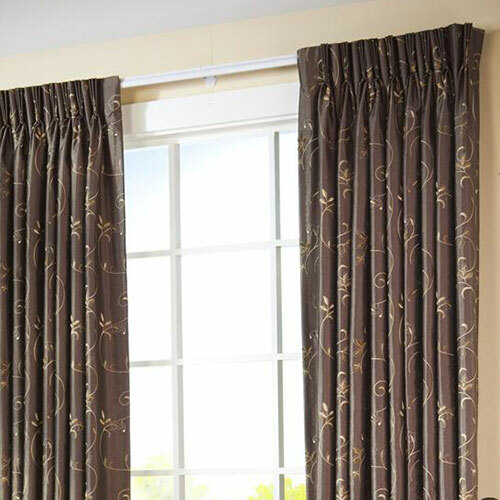 Stack back - Eyelets stack back really well getting your drapes off the windows. This heading works really well when you are after a more contemporary simple style which will stack back well. Suitable for use with rods or poles only. For the eyelet pleat you need to ensure you have enough space behind the rod so the folds of the eyelet can run smoothly along without touching the wall or window. 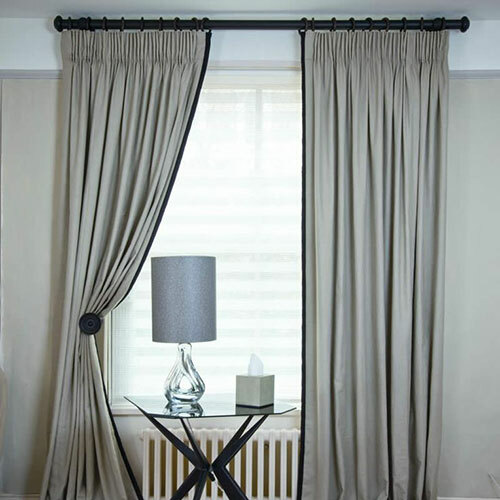 Tab Top drapes are a simple modern style heading, used a lot with sheers and voiles. 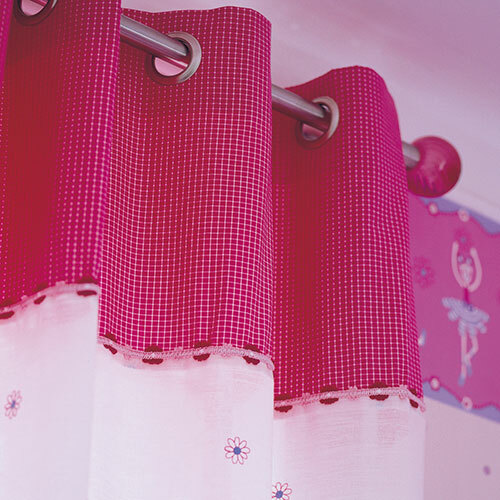 They are suspended from a rod or decorative pole by means of loops or tabs located at the top of the panels. Usually tab tops do not have much fullness but you are able to make as full or as flat as you like by changing the distance and size of tabs. The simple and casual design works well in many different settings but has a more informal appearance. 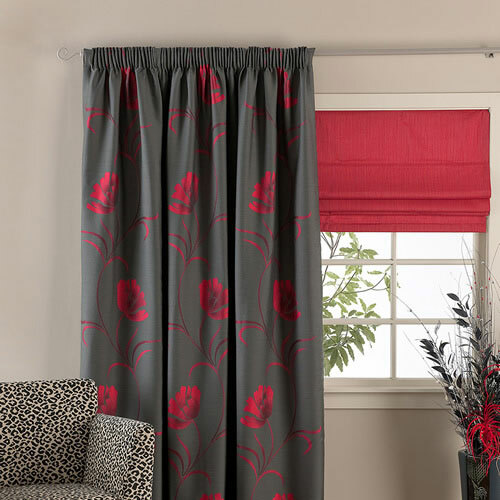 While the basic design for tab top curtains is straightforward, it is possible to accentuate the panels with small touches such as buttons or ties at the bottom of each tab or pulling the tabs into pleats etc. 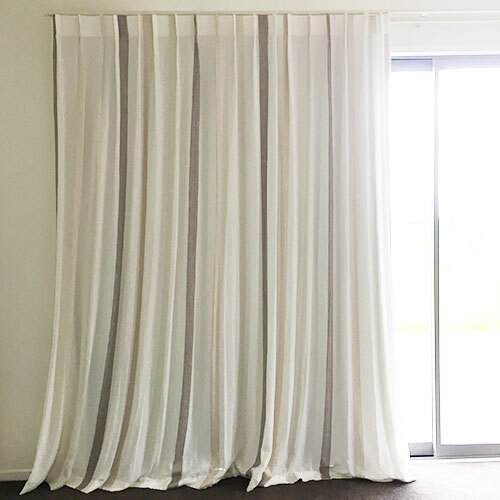 Tabs work best in unlined sheer drapes, they do not move as easily across rods as standard ‘hooked’ headings and the heavier the drape the harder to move. Another twist on the tab top is a ‘tie top’ where the panel is suspended from the rod or pole with ribbon or strips of fabric tied over the rod into bows or knots. 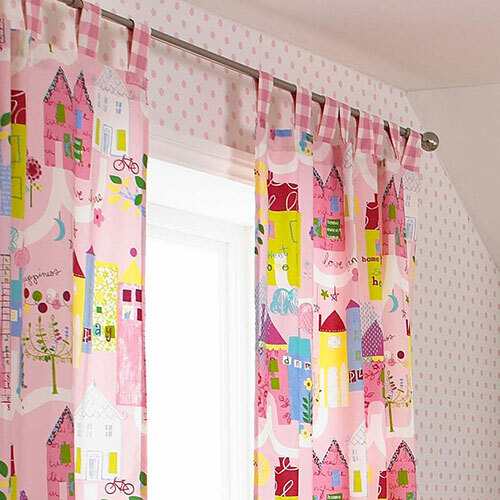 This looks great in soft feminine voiles and great in kids rooms as a more informal yet pretty heading. Stack Back - Tab tops stack back really well, they can be pushed right off the window but can have a more messy, casual appearance when stacked. The heavier and thicker the fabric the more space it will take up at the sides. Suitable for use with rods or poles. Should not extend over 3-3.5 mtrs as the maximum, as the tabs can not move past brackets so therefore the rods have less support. 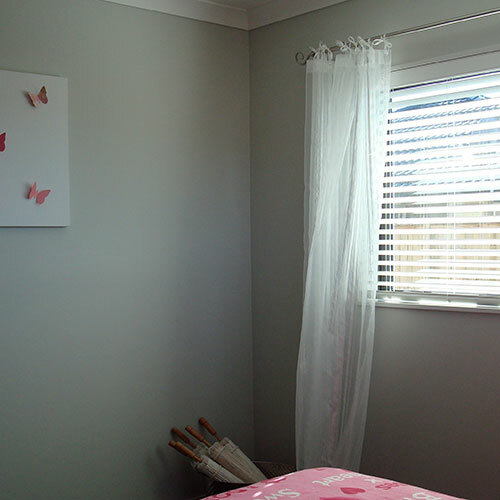 Lighter curtains can be suspended a lot further in width than heavier drapes. 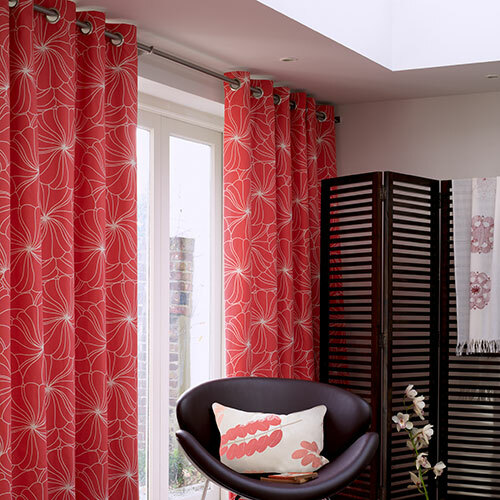 Wave Pleats are a new, modern design, giving a simple, contemporary look. They are similar in a way to the Eyelet heading in the way they fold into 'waves'. There are specialty tracks made for them so they can slide underneath and give a soft wave look. Each pleat or 'wave' is pre-determined by the tape and the track to stay in the shape required. 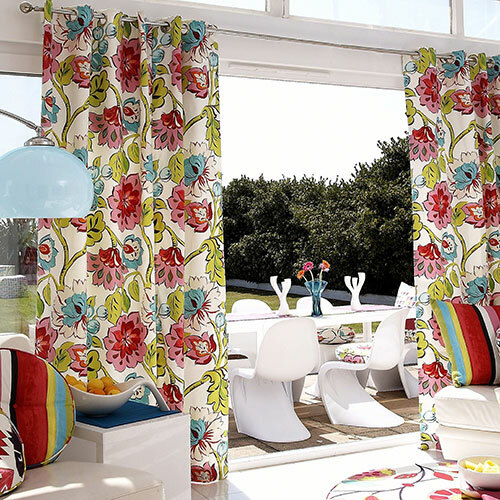 This modern design can be used with any fabrics, from sheers to solid lined drapes. 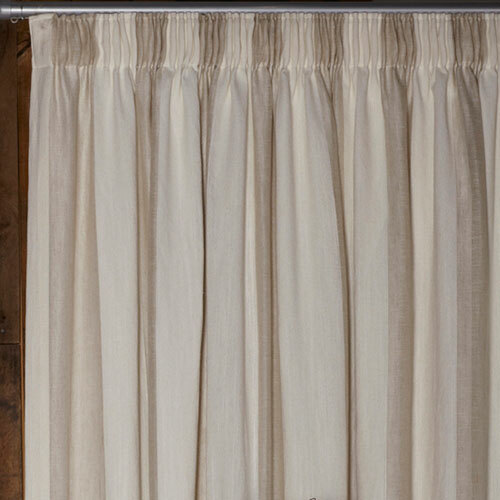 Soft sheers look particularly gorgeous in this heading and it really suits long full length drapes as opposed to little short ones. 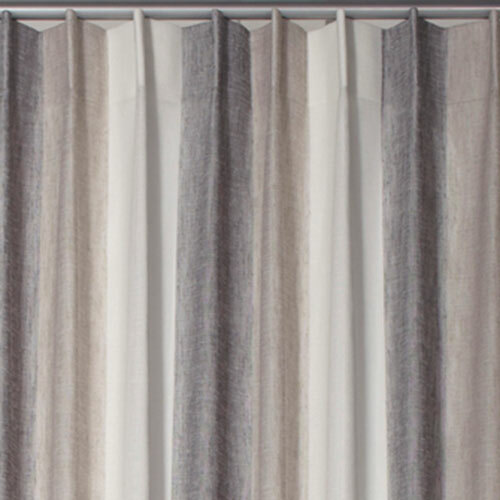 Ceiling to floor drapes look exceptional in this pleat. 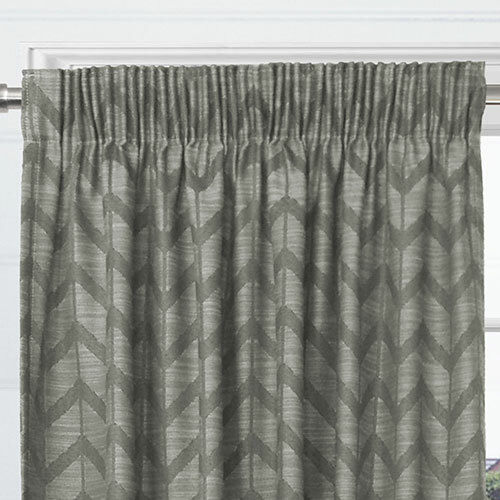 Again this pleat works well to showcase any pattern or stripe on a fabric as no part of the fabric is hidden in pleats. 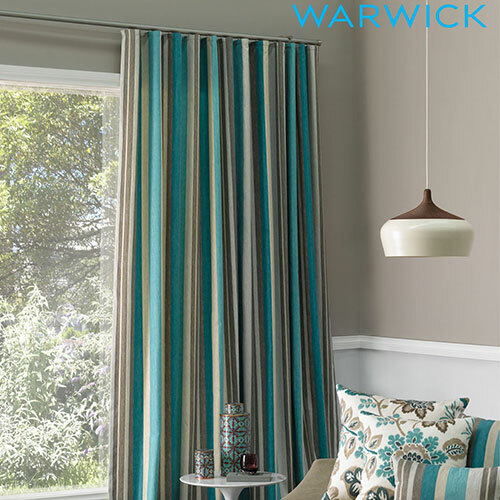 Stack Back - The wave pleat stacks back quite well at the side of your windows and creates a lovely clean look when stacked back. It stacks back beautifully into its folds, to give a lovely, tidy and simple look. Suitable for use with specialty track rods. 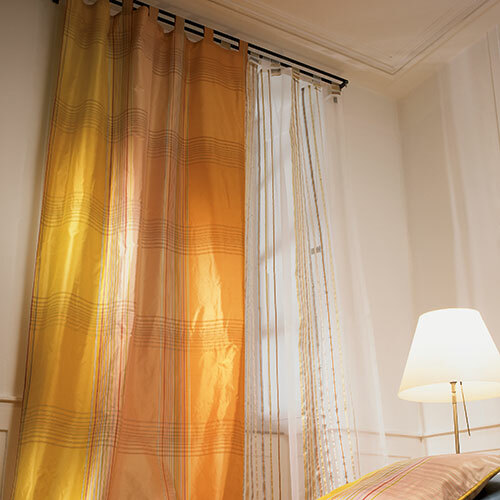 They have special glides built in that run on a chain system to keep the fold in the curtain at the exact right space. You can get tapes that help to create this same look that you can use on a rod, but they don't look as good as when you use the whole proper system. 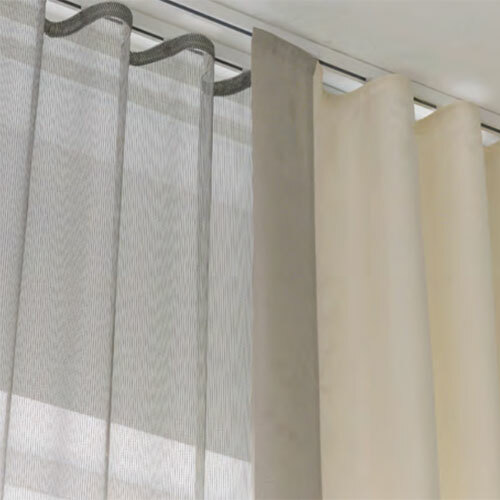 These pleats can not be used on a flat track as the wave needs to protrude past the back of the rod, so they need to be hung under a rod where they have space to fold back.